the sparkly life: Happy Holidays! Once again, we went with Minted for our cards this year, and--once again--I was so, so happy with the results. I love that Minted offers so many cute designs, that they can print the return address on the envelope (lifesaver! ), and that there are really cool ways to customize your cards. 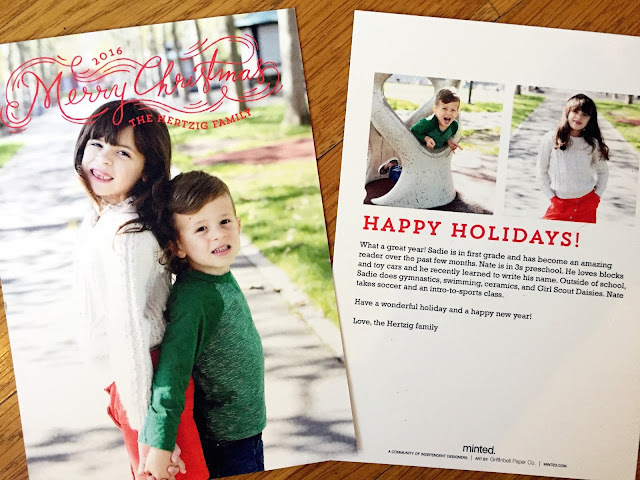 I went with the "Whirlwind Christmas" design, and chose to personalize ours a bit further by including two more photos on the back, plus a short update about what my kids are doing these days. (If you're interested, here are some past holiday cards: 2015, 2014, and my "work" card from 2015--still a favorite!). Whatever you're up to today, I hope it's amazing! Have a wonderful holiday. Disclosure: Minted--a brand I have long used and loved--gifted me these cards, so that I could consider them for coverage on this site. As always, all opinions are my own.